This modern hot toddy recipe will wake up your taste buds while relieving your winter blues! 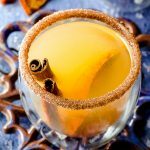 Warm turmeric ginger tea and spicy ginger liqueur garnished with a slice of caramelized orange, perfect on a cold winter night. Serve the tea hot, add ginger liqueur to taste and garnish with orange slices. You can also dip the glass or mug rim in the tea and cinnamon sugar.